It took a while, but now it’s cold. We have sub-zero temperatures since three days. The winter comes late, but at least we have a little bit winter now. I was hiking a couple of times, I walked through forests, over fields and alongside the river, but yesterday I really had to abort my tour after two hours walking, because it was teeth-chattering cold. I like the fresh and clean air when it’s cold, but there is a change of thinking if you walk two hours outside at minus 10 degrees. Hot chocolate is the best drink after a winter hike, I enjoyed three cups after my hike. Today we had only minus 7 degree and they said in the news that it will be warmer again soon, it seems the winter will not last that long this time, but who knows. I am still in Reinfeld, I extended my stay for a month to help my uncle. His health is much better now, but there are still a few problems. We currently search a new home for him in Lübeck, that means there are still a couple of things to solve, I stay a little longer so that I can help him to manage some things. Today I purchased a new hard disk drive for my PC and I will use the evening to freshly set up my PC. I really needed a new hard drive, because the DSLR photos take so much space when you store them all in high-resolution. I purchased a 2 terabyte hard drive, and together with my old 500 gigabyte hard drive I should now have enough space for the future and for all the games I play, for all the software I use, and for the files I want to store. I can only imagine what minus seven would feel like but that picture looks cold! I am glad you like the photo, I enjoyed the hikes and what I saw. Once everything is installed on my PC, I will upload some other photos I shot. It looks like ice is forming on the pond (or is it the river?) there. It has been strange out here in Phoenix with hail falling yesterday. Many people here have never seen hail in their entire lives. Strange winter, this one. Glad to here your uncle has improved. This is a pond, but a fairly big pond,… it takes an hour to go around the pond. There are some interesting smaller ponds connected to it, they do bread fishes like carps there. 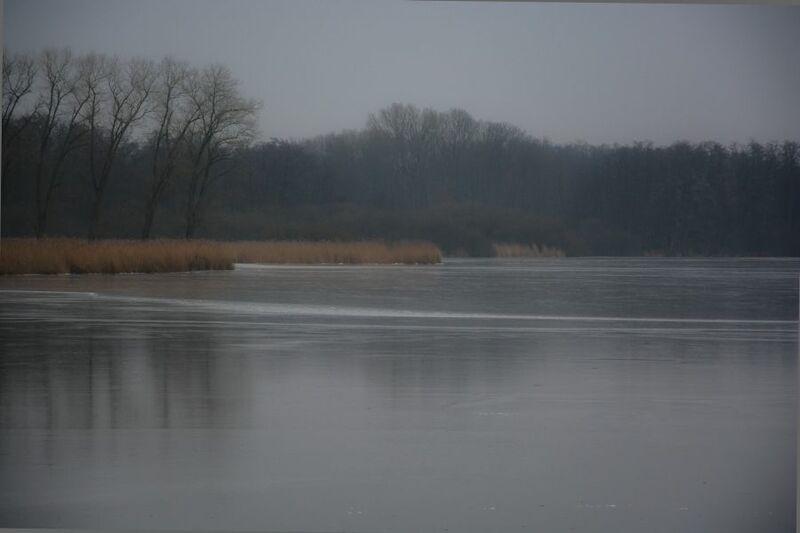 But the big pond is nature reserve today and humans don’t touch it, there are just some paths for hiker and nature interested people 🙂 Yes, you are right, the ice was forming one day earlier, but the day I shot the photo, the pond was already frozen to 90%. Yes, I hear this from many people, the weather is stranger everyone in the world. Thanks you, I am happy too about my uncle’s improvements, but there are still something where we need to help, as the planned moving and so.